Rene Buest is Director of Technology Research at Arago. The Frankfurt based company Arago is a pioneer in the field of artificial intelligence and one of a few companies worldwide to offer a commercially proven general artificial intelligence platform. In 2014, Arago partnered with leading global investment firm KKR to scale and internationalize its business. Prior to joining Aragao, Rene was a Senior Analyst and Cloud Practice Lead at Crisp Research, Principal Analyst at New Age Disruption and member of the worldwide Gigaom Research Analyst Network. At this time, Rene was considered as a top cloud computing analyst in Germany and one of the worldwide top analysts in this area. In addition, he was one of the world’s top cloud computing influencers and belongs to the top 100 cloud computing experts on Twitter and Google+. Since the mid-90s he is focused on the strategic use of information technology in businesses and the impact IT has on our society as well as disruptive technologies. Rene Buest is the author of numerous professional technology articles. He regularly writes for well-known IT publications like Computerwoche, CIO Magazin, LANline as well as Silicon.de and is cited in German and international media – including New York Times, Forbes Magazin, Handelsblatt, Frankfurter Allgemeine Zeitung, Wirtschaftswoche, Computerwoche, CIO, Manager Magazin and Harvard Business Manager. Furthermore, Rene Buest is speaker and participant of experts rounds. 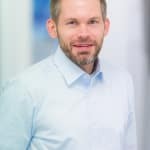 He is founder of CloudUser.de and writes about cloud computing, IT infrastructure, technologies, management and strategies. He holds a diploma in computer engineering from the Hochschule Bremen (Dipl.-Informatiker (FH)) as well as a M.Sc. in IT-Management and Information Systems from the FHDW Paderborn.